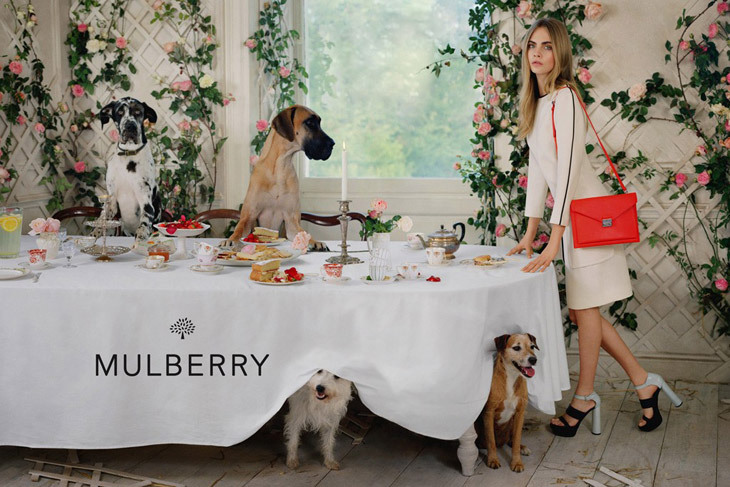 Tim Walker created yet another dreamy campaign for Mulberry with supermodel Cara Delevingne and this time it is a cheerful tea party with animals. The campaign was photographed in the very same 18th century mansion in Oxfordshire where the fall/winter 2013 campaign was shot. While the previous campaign was rather dark and gloomy with Cara being surrounded with owls, this one is very bright and summery. The art director Cooke Newhouse said that it was a “beautiful but naughty tea party with Cara and her ark of animals” and added that they “didn’t have the best table manners, but Cara was very forgiving”. When asked what is her favorite Mulberry bag, Cara replied that it is the one named after her, which hasn’t been made yet. She expressed her wish to design a Mulberry bag and trainers.